Pepperdine University will host the 46th annual School of Law Dinner at the Beverly Hilton in Beverly Hills on Saturday, March 30, at 6 PM. The Honorable Clarence Thomas, associate justice of the Supreme Court of the United States, will serve as this year’s featured speaker. Alumna Brittney Lane Kubisch (JD '12) and DC Circuit judge Greg Katsas, both of whom served as Thomas’ clerks, will also share their unique career experiences and discuss how Pepperdine graduates can continue to thrive as advocates and peacemakers to advance the rights and liberties of people around the world. The annual School of Law dinner is one of Pepperdine Law’s most significant and prestigious events. 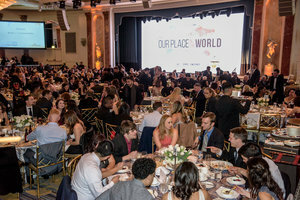 The dinner provides an important opportunity to celebrate student success, demonstrate the school’s progress and commitment to the Pepperdine mission, and build enthusiasm for its vision. Tickets are required for this event, with reduced prices offered to University faculty and staff, and Pepperdine Law students. For additional information about the event, and to purchase tickets, visit the Pepperdine University page on the Engage website.